Origin and Habitat: Uruguay and Argentina. Altitude range: 100 to 1800 metres above sea level. Habitat and ecology: It grows among grasses in densely vegetated hilly terrain, in moderately steep rock grassy slopes, in rock-strewn terrain and flat meadows with rock inclusions. 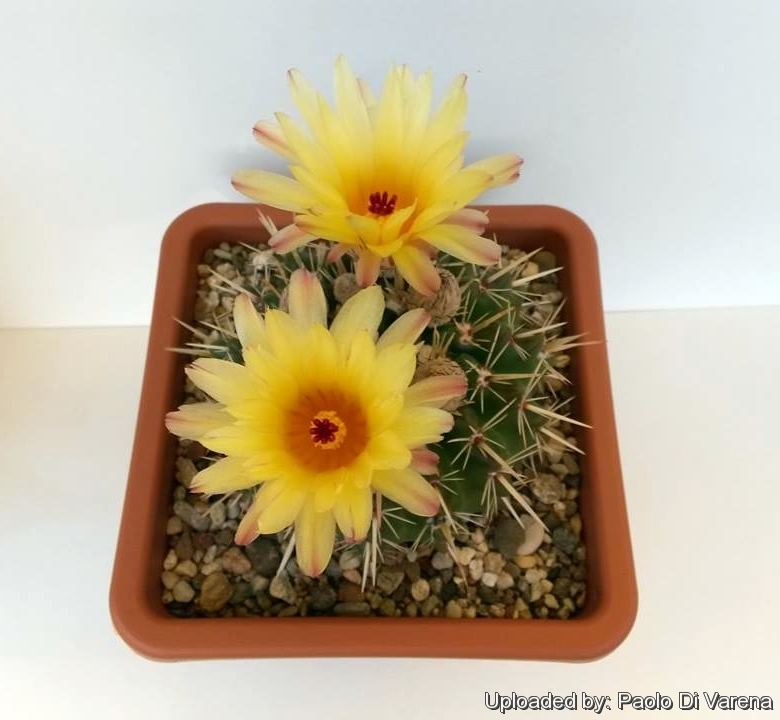 Description: Parodia mammulosa subs. 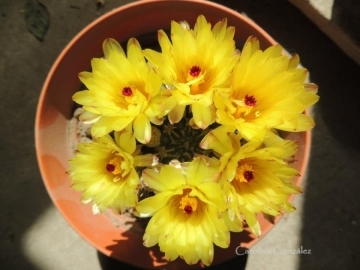 submammulosa commonly known as Notocactus submammulosus is a solitary cactus more or less covered by interlacing spines with large yellow, orange or red blooms with yellow centre, about 2,5-4.5 cm in diameter, short tubes and pink to red stigma. 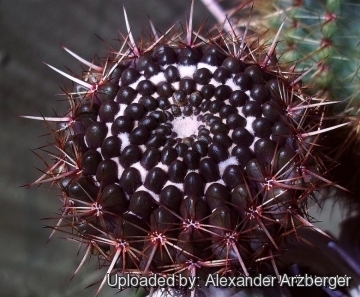 It is similar to Parodia mammulosa but with fewest number of ribs (about 13), about 6 radial spines spreading out horizontally, and two long and flat central spines, of which one longer and pointing down, and another a bit shorter and pointing up and also differing in quite a few other ways. 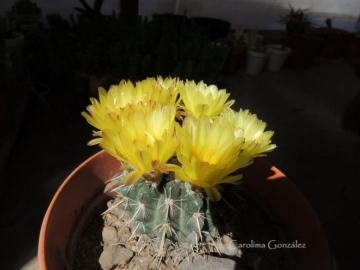 among the the most wide-spread of the Parodia species and are quite variable in appearance. The great variability is due to the fact that cross pollination among different forms and different species (both in habitat and in collections) is very frequent and it can be quite difficult to determine what is the "pure type" and the cross, and the differences among individuals may be remarkable. 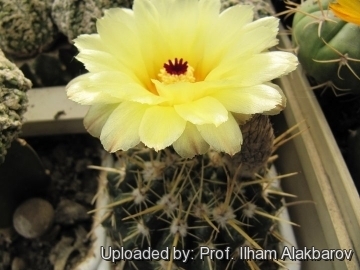 Plants may differs considerably about the form and arrangement of the spines, stems, ribs and flowers colour with unclear morphological limits between the different forms. It can happen that two individuals of two different populations can look very similar and also, two plants of the same population can look very different. There is so much variation that most authors choose to lump them together. Ribs: About 13 but occasionally up to 18, straight, well distinct, with prominent, rounded tubercles with chinlike protrusion. Central spines: 2 (or more) up to 20 mm long (or longer) usually flattened, of which one longer and pointing down, and another a bit shorter and pointing up, thicker, straight, white, yellow to brown with a brown tip. 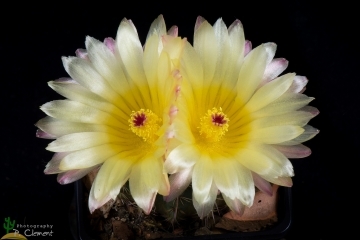 Flowers: Pale pink, orange to golden yellow with a clear yellow centre, beautifully emphasized by the purplish/red stigma lobes, 2.5-4.5 cm in diameter, with a short tube covered with white wool and brown bristles.